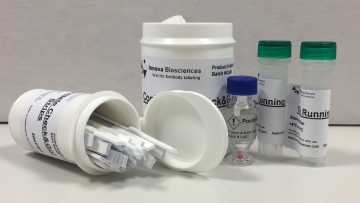 Innova Biosciences (Innova), a specialist provider of bioconjugation products and services, today announced the launch of the Conjugate Check&Go! Kit, the company’s first lateral flow product specific to antibody labeling. The new kit allows scientists to confirm, in one easy step, whether an antibody has been successfully conjugated before moving on to more extensive testing in their assay application. The Conjugate Check&Go! Kit is compatible with conjugates generated using InnovaCoat® GOLD nanoparticle and Latex conjugation technologies, and Innova’s Lightning-Link® fluorescent dye labeling kits. The product will also work alongside any other conjugation technology that uses colored labels. Innova Biosciences’ conjugation technologies include Lightning-Link® for antibody & protein labeling, InnovaCoat® GOLD nanoparticles and Latex beads, and Thunder-Link® for oligonucleotide conjugation.